Since I learned the meaning of the word “worship,” every time I watch an exuberant pup kiss its owner, I think of how my relationship with God should be—as a holy kiss. Who can resist a puppy’s kisses? With tail wagging, they can hardly contain their happiness. Pups try with every wiggle and wag to show their excitement. They may even knock us over in their joyful effort to be as close as possible. Among other meanings, the word “worship” means “kiss” and compares to that of our canine pets licking our hands and faces. Worshiping God is an expression of joy—a time when we offer our joy in being in His presence and a time when He becomes joyful in return. 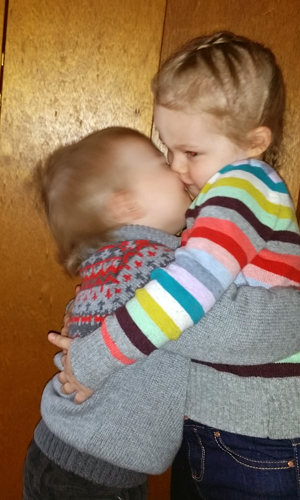 A kiss between siblings or friends may be expressed in a manner unlike between husband and wife, and differs from one part of the world to another. Early church members were encouraged to “Greet one another with a holy kiss.” (1Corinthians 13:12) Such expressions of caring likely meant kissing the cheek. Today Christians still use that form of love, one to another. And therein lies the key to worship. As our worship of God through Christ expresses itself in joy, it also shows Him our love. When we commune with Him through His Word, prayer, fellowship and obedience, we do so from the heart—from our innermost being. Like exuberant puppies with their owners, we worship God freely—because we want to. Jesus spoke to a Samaritan woman at a well about worship. “The hour is coming,” He said, “and now is, when the true worshipers will worship the Father in spirit and truth; for the Father is seeking such to worship Him. God is Spirit, and those who worship Him must worship in spirit and truth.” (John 4:23-24) When we’re born of the Spirit, we can crouch like puppies and prostrate ourselves in holy reverence during a church service. Or we can commune with Him in joyful, heartfelt worship while we’re at our work place, at home cleaning or negotiating peace among our children. True worship of God is a matter of the heart. True worship is as simple as kissing God. Lord, thank You for Your continual kisses of love in the form of love, joy, peace and righteousness. Like puppies, we offer You our joy and love and obedience. In Jesus’ name, amen. Our vows to follow Jesus are even more important than those we repeat in marriage. After all, He is our Bridegroom, the One we need—and should want—to be near at all times. May the honeymoon never be over for you as you follow Him with joy and in obedience. 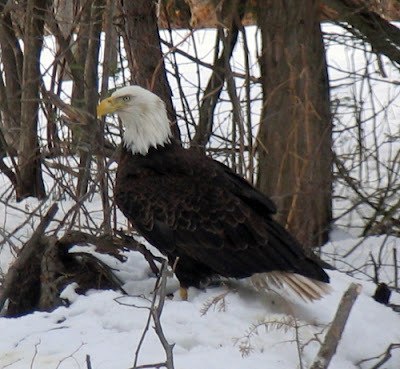 We northerners enjoy seeing bald eagles soaring overhead or feeding on carrion along our roadways. Bald eagles mate for life. In fact they, along with wolves, put our human race to shame when it comes to remaining monogamous. Vowing to remain devoted to a spouse has become unimportant for much of western society. For many couples, their “I do’s” includes a list of “I don’t’s” that has ended marriages long before death do they part. More and more, among both non-Christians and followers of Christ, the honeymoon period of marriage seems to grow shorter and shorter. The solemn promise of a marriage vow can compare to that between a person and God. When we say “I do” to God, pledging to trust, follow and obey Him, it should not be taken lightly. We believers may see our new life with the Lord as a marriage, wherein we want to spend all our time with Him. We take joy in learning more about Him through His Word and spend time talking to Him in prayer often. Even daily. We trust He will take joy in us, protect us, give us strength and provide for our needs. In fact, He will be jealous of us, just as a wild animal shows jealousy by guarding its mate. When a couple falls away from their closeness by allowing outside influences to take the place of their spouse, they may lose their unity forever. The best marriages are by couples who keep their vows to love, honor and obey their spouses. They vow to spend time alone together each day, whether sharing a walk in the woods, enjoying a meal out or sitting on the quiet porch where they can discuss their daily joys and sorrows and make plans for the future. When young children are involved, a couple can steal alone time somewhere, even behind closed doors..
Lord, thank You for the example of monogamous bald eagles and wolves that show us their continual devotion. Compel us to remain true to our spouses. And cause us to love, honor and obey You above all others. In Jesus’ name, amen. ARE YOU FULL OF GOD'S JOY TODAY? The joy of the Lord is our strength, unlike the fleeting happiness of the world. Let us rejoice and be glad in each day, each hour He gives us. The flu bug took up residence in my whole body, including my brain. Since I couldn’t think clearly but needed a diversion, I watched comedies on my DVD player. Mindless yet entertaining, the I Love Lucy shows made me laugh. I not only enjoyed them, I learned that laughing benefited my health. Those silly movies helped bring healing to my body. 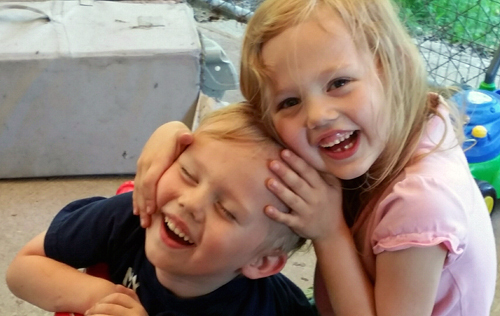 God knows we all need laughter, especially when we’re facing troubled times. Whether we suffer from the flu or emotional pain, we become healthier when we are merry. But merriment comes from joy, not merely from happiness. At times we can’t or shouldn’t be happy, such as when we or others are hurting, grieving or facing other kinds of loss. Happiness differs from joy. The happiness we feel while watching humorous movies or listening to jokes is fleeting and external. True joy, however, is not an emotion; it’s an attitude. We can choose to be joyful regardless of our circumstances. When we know without doubt that we’re loved, valued and accepted by God, we will be filled with true joy. The Bible records almost 250 times the words rejoice and joyful. Perhaps the most familiar Bible verse about joy is found in Proverbs 17:22. “A merry heart does good, like medicine, but a broken spirit dries the bones.” The biblical word “merry” means joyful, as opposed to the word “dries,” which denotes withering, confusion or disappointment. None of us sets out to look or act like our bones are withering. We would rather have others see us as joyful. The joy we experience, in spite of what is happening, not only brings personal health, it rubs off onto those around us. God would not have us be serious all the time. Our joy should be evident in our words and actions. In fact, when we choose to obey and walk in His teachings, joy should be an automatic response to Him. Jesus said, “These things I have spoken to you, that My joy may remain in you, and that your joy may be full.” (John 15:11) Complete joy comes when a follower of Christ experiences His love. We may enjoy jokes and humorous movies and benefit from the healing effects of watching them. But only through Christ and His love can we enjoy total healing, Godly joy and peace of mind. Lord, thank You for giving us a merry heart and for Your indescribable joy that comes in knowing You, obeying You and following after You. In Jesus’ name, amen. The word “amen” means sure, trustworthy, and solid. May we remember that each time we use the word. 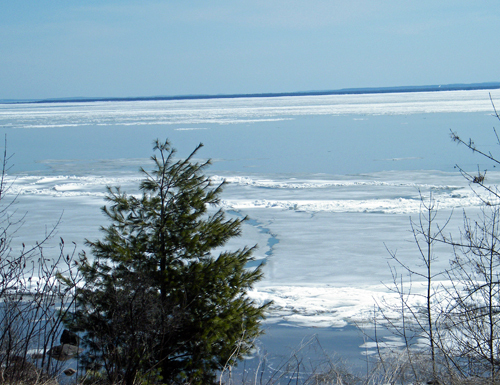 The ice on Chequamegon Bay this winter proved to be solid enough, in spots only, to hold a pickup or fishing shack. Other spots were fraught with fissures or too thin to support even a man. Thin ice has already caused several accidents. Sometimes our faith in God can be weak, too. We may believe Him in some things but not others. We may trust ourselves more than God to solve our problems, bypassing His Word, His quiet voice or His promises in favor of our own solutions. Or we may believe God is so far away that He doesn’t want to bother with our insignificant lives. I recently learned that the word “amen” comes from the same root word as faith and it is more solid than the thickest ice. I never gave much thought to the word amen. It happens to be the word used at the end of a prayer, a word perhaps most of us take for granted. Yet, it is important. Amen means sure, trustworthy and solid. When we say amen, in essence we are saying “It’s true. Yes, I agree.” But we may be so used to saying amen after a prayer or someone’s statement that we dismiss it from our minds. Saying amen is like saying yes to God—to His salvation and love. It is saying it with our whole heart, soul, mind and strength. The implications of believing in Him wholeheartedly are great. “If you will not believe, surely you shall not be established.” (Isaiah 7:9) Believing in Him is the key to receiving His promises. Such truth is sprinkled throughout the entire Bible. Paul tells Christians to remain steadfast in faith. “As you therefore have received Christ Jesus the Lord, so walk in Him, rooted and built up in Him and established in the faith, as you have been taught, abounding in it with thanksgiving.” (Colossians 2:6-7) We can add an amen to that! We are also told that without faith we cannot please God. As we remain in God’s Word and close communion with Him, our faith—our amen—will increase in strength. We won’t have to be afraid of walking on unstable ground or on thin ice that won’t hold us up. His promises are amen-sure, solid enough to see us through any problem. Lord, thank You for Your solid, unshakeable truth. Help us to stay away from unstable and unsafe situations and temptations that might cause our faith to falter. In Jesus’ name, amen and amen.